We’re announcing our intent to have fully autonomous vehicles in commercial operation for a ride-hailing or ride-sharing service beginning in 2021. This is significant. Ford will be mass producing vehicles capable of driving fully autonomously within five years. No steering wheel. No gas pedals. No brake pedals. A driver will not be required. If someone had told you 10 years ago — even five years ago — that a major American car company would announce the mass production of a vehicle with no steering wheel, you would have said they were crazy. As little as four years ago, our approach was aligned with the thinking of most automakers today, which is taking incremental steps to achieve full autonomy by advancing driver assist technology. This is not how we look at it today. We learned that to achieve full autonomy, we’d have to take a completely different pathway. So, we abandoned a stepping-stone approach and created a dedicated “top down” engineering program to deliver fully autonomous vehicles and the new mobility solutions and business opportunities that a fully autonomous vehicle could deliver. The world is changing, and it’s changing quickly. We’re not sitting on the sidelines. Ford will be actively driving that change. It’s now clear that the next decade will be defined by automation of the automobile. In fact, we see autonomous vehicles as having as big an impact on society as Ford’s moving assembly line did a hundred years ago. It’s important to understand that this is not just about building an autonomous vehicle. There’s something deeper, something that motivates us every day, something that’s in the DNA of our company. More than a hundred years ago, we were founded with a clear mission: to make people’s lives better. Our founder Henry Ford believed making transportation accessible would advance human progress. Cars used to just be for rich people, but the innovations at Ford brought the automobile to millions of people. At the time, it was a radical idea. Most people in the U.S. didn’t travel very far from their homes. When car ownership became a reality for millions, people became more connected; they explored more and found greater opportunity because they could live, work and play where they wanted. In a way, it was a revolution in the connectivity of average people the likes of which we haven’t seen again until recently. This principle of bringing life-changing technologies to millions of people is at the core of what we do. When we step back and look at how we can make the most difference in people’s lives during the next 100 years, we see the autonomous car changing the way the world moves once again. That’s because autonomous cars address a host of safety, social, and environmental challenges. Let’s start with safety. Right now, there are more than 30,000 motor vehicle deaths a year in the United States. Approximately 90 percent of those deaths are attributable to human error. Autonomous vehicles have the potential to reduce those fatalities. And that alone is a powerful motivator for us. But there’s more to it. Autonomous vehicles will open up opportunities for the elderly, people with disabilities and people not yet old enough — or those that don’t want to own a car — to get around. We’re designing this first generation of autonomous vehicles specifically to be used for ride hailing and ride sharing — another seismic shift in the transportation landscape. The nature of ownership is changing. More and more people rely on shared forms of transportation. That means cars will be used more efficiently, decreasing pollution, saving people time hunting for parking and helping reduce traffic congestion, all over the world, making life better for all of us. That’s why we introduced Ford Smart Mobility to offer a wide range of transportation solutions. Ford Smart Mobility is our plan to lead in autonomous vehicles as well as in vehicle connectivity, mobility, the customer experience, and data and analytics. We know that there’s no such thing as a one-size-fits-all transportation solution. Everybody is unique. For most people, autonomous vehicles are a new idea, so we also understand that trust matters. We have spent the past century earning that trust. We know how to make safe, quality vehicles at high volumes to meet the needs of people around the world. We’re not new to autonomous vehicles, either. It started back in the days of the 2005 DARPA grand challenge when we were the only automaker-led participant and where we initially defined our technical foundation for autonomous driving. As we march toward this autonomous vehicle in 2021, we’re making some other changes to help us get there. We’re announcing today that we’re expanding our presence in Silicon Valley going from a single Research and Innovation Center building to create an entire campus with the addition of two buildings right across the street. We will double our staff by the end of next year, and we’re very happy to be attracting some of the best engineers, technologists, designers and researchers available. They’re coming to be part of a unique opportunity that few companies can offer. Ford invested in Velodyne, the Silicon Valley-based leader in LiDAR (Light Detection and Ranging) sensors, to move quickly towards mass production of a more affordable, automotive-grade LiDAR sensor. 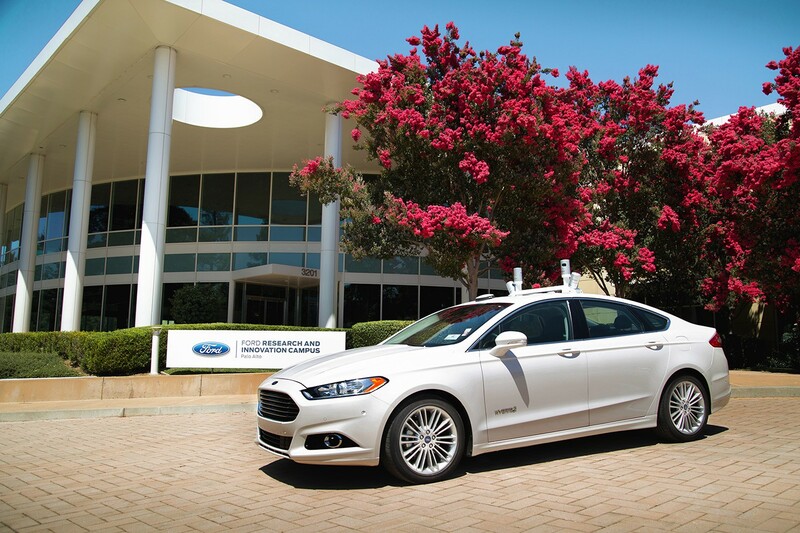 Ford has a longstanding and established relationship with Velodyne, and was among the first to use LiDAR more than 10 years ago during the DARPA Grand Challenge. Today, we’re increasing our investment, to mass produce the advanced and critically important sensors that help autonomous vehicles navigate on their own even faster. We’re acquiring SAIPS, a machine learning and artificial intelligence start-up based in Israel, which will play a key role in image and video processing, object detection, signal processing and deep learning capabilities to help autonomous vehicles learn and adapt to their surroundings. We’re forming an exclusive licensing agreement with Nirenberg Neuroscience, founded by neuroscientist Dr. Sheila Nirenberg, who cracked the neural code that the eye uses to transmit visual information to the brain. She’s created a way to treat human blindness, combining software with prosthetic eyes to allow the brain to see. Now, Dr. Nirenberg is working with us to help Ford’s autonomous vehicles “see” the world around them. And we’re investing in Civil Maps, helping us develop 3D, high-resolution maps of our autonomous vehicles’ surroundings. These four new partnerships build on a recent Ford investment in Pivotal, which is helping accelerate the software needed to support autonomous vehicles. Plus, we’re working with a long list of universities around the world, including Stanford University, MIT, the University of Michigan and Aachen University in Germany. Today, automobiles are extremely sophisticated. There’s been a perception that automakers are just the hardware guys; we’d make the cars and plug in somebody else’s software to turn them autonomous. Well, that’s not the case with Ford. Most vehicles are made of 4,000 to 6,000 parts. They have more than 130 million lines of code supporting everything from engines to driver assist technology to entertainment systems. And, we’re connecting them to the cloud. We are the ultimate systems integrators. We’ve been making it all work in a seamless, satisfying way for consumers for decades. Therefore, for us, autonomous vehicles are the next natural step. Of course, putting a mass-produced autonomous vehicle on the road in five years is not without a lot of innovation and hard work in front of us. This is a transformational moment for our industry, and for Ford. We’re not only embracing this challenge; we’re energized by it.